We had seen a HUGE Snow Village display at an inn in Vermont and I knew that I wanted one, too. So, I started collecting the individual pieces. After a couple of years, Mr. L bought a big sheet of plywood that he attached some folding legs to, and I had a place to display my ever-expanding village. As I got more pieces, he built risers so that I could have the residential section above the commercial part of the village. It was very cute! My Snow Village is the real one from Department 56. I don't think they make them anymore. They started doing all kind of franchise stuff, like with Coke and John Deere, etc. and then it just became too commercial and I stopped buying them. I liked it better when the ceramic buildings were a little more crude ... and a lot more whimsical. But by that time, we also had enough furniture. The other day I was reading in my favorite spot across from our really big entertainment center and thought -- I could put a few pieces of the village up there. As it turned out, I could fit four (well, really five--one of them came in two parts) pieces up there. I'm so pleased to see my Snow Village again (or part of it -- a quarter of the buildings are still in storage). What's your favorite holiday decoration? I love your village. My SIL and MIL both have some type of scene set up and it's very beautiful. As for my favorite.....I have several. Ceramic doves that clip onto the tree branches and glass bells, that hand inside each other biggest to smallest. These were purchased for our very first Christmas and still make it onto the tree every year. We also have blown glass hearts but they don't always make it. A friend worked as a glass engraving place and we got one every year with an extra for "Baby's First" until she stopped working there and they closed the one near us. I pretty proud that the bells have lasted this long (26 years), two kids, multiple cats (who climb Christmas trees) and two moves. Lorraine, I have a snow village too! It's the Dickens theme from Department 56. I have about seven buildings and a few accessories, like trees, benches, lighted street lamps, Dickens doing a reading in the park, etc. 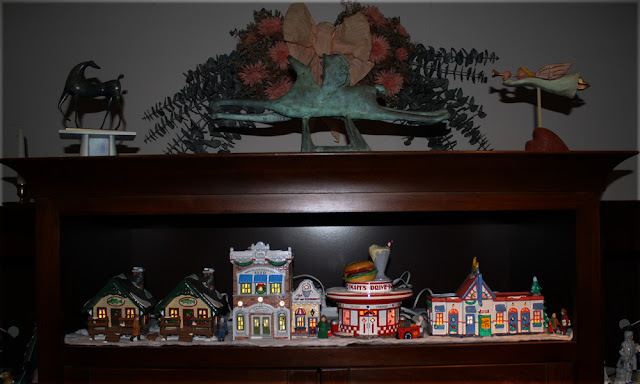 I started with The Olde Curiosity Shoppe, and then for Christmas every year afterward, I'd get one addition to my village, so that after about 10 years I had a beautiful display. One of my daughter's favourite Christmas prep activities was putting out the village on our special table that my hubby made for it. When we moved to Bermuda, the Christmas Village was one of the things we put into storage until we return. I missed it at the last two Christmases and it's one of the things I look forward to unpacking from the storage unit when we go back to Canada. What a nice village. My parents have a village and always admired it. I love your Snow Village! Mine is a mix of Dept. 56 Dickens and some generic pieces. I love it and can hardly wait to set it up each year (usually Thanksgiving weekend). My beloved Saffron kitty (RIP) loved to sleep in the midst of the village and stare inside the buildings, so the village reminds of happy memories of my sweet kitty. I love the display of your snow village. I love your village! I think you really need to create a space to display it all, even if not every year. My favourite peace of decorating will always be the christmas tree itself. Fully decorated. I have a combo of the Snow Village and Winter Village pieces from Dept 56. My favorite is the big Ice Castle with Mr and Mrs Claus. I haven't been able to put it up for a few years due to room constraints too. I think this year I have enough dragons so I can do a sep dragon tree and will probably do another one again, with just flamingos. I hope all the work, or some of it, is done by Xmas so I can do some decorating. I inherited my Mother's Snow Village from Dept 56. She first started displaying the pieces in one corner of the living room set up on different levels. It would take her one day to get them out and one day to put them away. Eventually, she bought three huge curio cabinets for them so she could enjoy them year round. I'm aiming for that myself Shirley! My favorite is a construction paper cut-out of my son's hand when he was five years old;it's a reindeer with his fingers being the antlers. I have a few village pieces too, they give the living room such a homey feeling. I love my village. It's not from any one company, just bits and pieces as they strike my fancy. We are working towards a holiday carnival now. Some of my favorite pieces are from the Christmas Story collection. I have the house with the 'fragilay' leg lamp in the window. The village has gotten so big, we've split it to part of it on one floor and part on the second floor. I think we are going to add a table this year. I add one or two buildings each year.